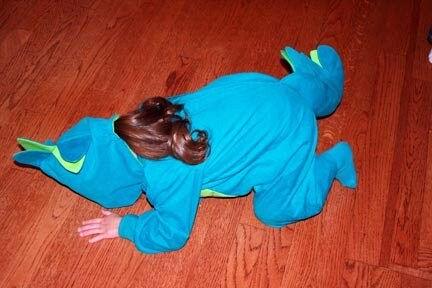 For Halloween this year, Abigail chose to be a lizard. My husband and I took her to JoAnn so we could decide on a pattern in early September. We picked out several and then let her chose one that she wanted. One of the patterns we chose contained six different costumes - a mouse, a dragon, a panda, an angel, a monkey and a devil (Simplicity 2506). They were all cute and we thought she might like the monkey. She did want to be a monkey, and carried the pattern around for a few days telling us she was going to be a monkey. Then one day, she announced she was going to be a lizard. I let her walk around for another few days before I bought any fabric. I didn't want to risk have scales on a monkey! I took Abigail to JoAnn a second time to let her pick out corduroy for her costume. (The pattern called for rayon cord with contrast in broadcloth. Since I could find no one who could explain what rayon cord was, I bought cotton corduroy. It seems to have worked well.) She chose the bright teal. I thought for sure she would pick pink, and I was rooting for the forest green. 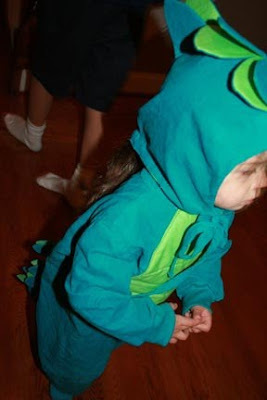 I believe in promoting individuality and creativity, though, so a teal lizard/dragon it was. I eventually found some lime green broadcloth to match. There were times when I really regretted tackling this project. It was harder than I expected it to be. And then I read about BreederMama's hooded sweatshirt costumes and felt really stupid. (I did decide to leave on the footie covers because we happened to have teal socks and teal crocs.) I got very fed up with it in early October just before we left for our long trip, and decided to take it with me. I hoped that someone might let me borrow a machine once I was in more relaxing surroundings. That didn't happen, but when we got home I was in a better place to deal with it. We got home on Sunday, October 25 and on Monday my sewing group met. I took the costume, asked for advice, and ended up spending most of the day ripping out the last couple of steps I'd finished before leaving for the trip (once again, the lesson of quit when you're frustrated). Anyway, I'd managed to sew the arms on in such a way that Abigail wouldn't be able to move when she got into the costume. Once I had an experienced seamstress standing over me, I got it done correctly. Abigail really enjoyed going for tricks and treats. We went over to her aunt's house so she could go with her cousins. Her daddy, her aunt or I walked with her to the first three houses or so, and then she got the hang of it and started running up and yelling "Trick or treat!" This is the same child who will cling to me through an entire playgroup without looking at anyone. It all depends on perspective, I suppose. After our dinner of chili and pumpkin bread, and a very long walk to get candy, Abigail ran around her aunt's house laughing and playing and eating some more. Then she had a huge lizard/dragon tantrum. Of course, she also kept announcing she was an alligator, so this photo could be of either one. 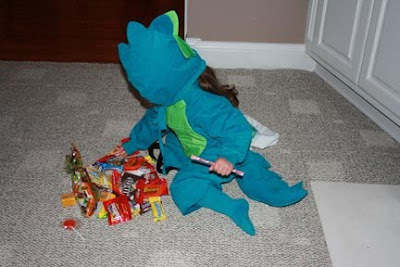 Oh, and I keep calling her a dragon because this costume reminds me of the dragon costume my Mama made for me when I was around the same age that got passed around to numerous cousins, siblings and neighbors before it was lost. It's a very, very cute costume! Well worth all the effort. Great job! She made an adorable little lizard.